Used as both weapon and ceremonial object, the tomahawk was created in an astonishing variety of shapes. 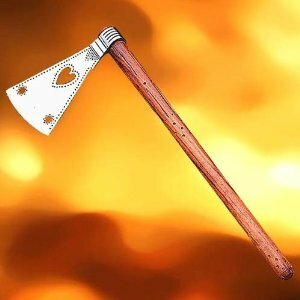 This collector grade tomahawk, made by Windlass Steelcrafts, is hand-forged with a high carbon steel blade. This example features indented dots that interplay with the piercings. Please note: This is not an authentic Indian made product. Overall: 23-3/8" Head: 9-1/8" x 5-3/8"
Hand Forged High Carbon Steel Blade with Decorative indents adn markings on blade. If you have any questions about this product by Windlass, contact us by completing and submitting the form below. If you are looking for a specif part number, please include it with your message.